Whether you are seeking love or are already in it, this inspiring memoir is about reaching the bottom of the love slide, only to come out enjoying the view from the top. 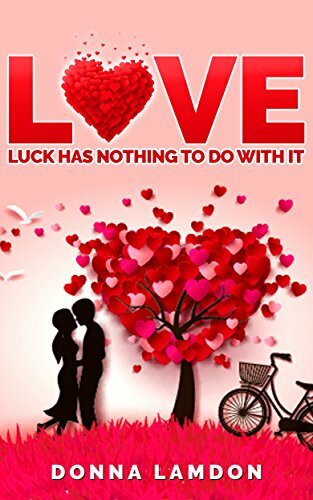 If you truly want to be lucky in love, you need to read this book. No more toads! Only princes! An insightful, humorous and creative memoir on how to manage the complexities of love and choose the one who is right for you. Finding a relationship is often the easy part. Finding a relationship which is right and positive and works well for you, can be frustrating and difficult to achieve. In this memoir of failed relationships and endless searching for Mr Right, Donna Lamdon will treat you to an often amusing, often painful and sometimes brutal account of one woman’s dreams, as she discovers that what she thought her life would be like, slowly dissolves into the reality of what it has become. Drifting from one totally unsuitable man to another, Love: Luck has nothing to do with it, will make you laugh with hope and cry with despair as the author takes you on a personal journey where she learned how to stop attracting the wrong men; addressed the common mistakes she was making in all her relationships; and reinventing her life to open the door for the right man to walk through. Ultimately, it will restore your faith that sometimes love can be found when you least expect it and that joy, love and freedom is a possible dream. Written with humour and in an open, down-to-earth voice, it is a powerful and practical memoir that every woman should read. Contrary to how it might have looked to an outsider, I did not wake up each morning and say to myself, “I think I’ll completely screw up my love-life today,” that stuff just happened. Of course, with the benefit of hindsight, I can clearly see why I experienced so many challenges when it came to finding the one thing I yearned for most – a healthy, loving, and nurturing relationship. I grew up just an average girl who expected to find a fulfilling, happy life with the perfect man. But life didn’t quite work out that way and instead I opened the door to fear, shame, abuse, regret, and self-hatred. However, I wasn’t paddling this boat alone. There were many other women with me, more of them single than ever before, and this wasn’t due to a lack of suitable men, or that more women were choosing to remain single. It was mostly because women attracted relationships that didn’t last, didn’t attract relationships at all, or entered into unhealthy relationships. The truth is, it does not need to be this way. I know, because I am living proof that achieving a fulfilling and loving relationship is within reach, even despite ourselves. While you may find some answers and solutions in this book, it is not my intention to offer counselling. There are professionals for that. It is, however, my genuine hope that after reading this book, you may begin, like me, to value yourself so much that you take your life seriously, be proactive and seek the support you need to affect positive change in your life. I promise you, when you reach that point, your life will change forever. You don’t have to continue self-sabotaging your love life. There is an alternative. You can make your own luck! Scroll up to grab your copy today.